In line with UK Jewish Film’s educational objective to combat antisemitism through film and in partnership with local authorities, this January we are delivering two Speak Out screening events based on The Rescuers for schools to commemorate Holocaust Memorial Day 2018. 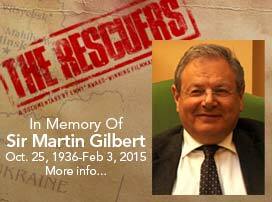 The Rescuers, by acclaimed director and producer Michael W. King, features Holocaust historian Sir Martin Gilbert and anti-genocide activist Stephanie Nyombayire, as they give a voice to the international diplomats who saved thousands of Jews during the Second World War. The events will offer students and teachers the opportunity to reflect on this year’s HMD theme: Power of Words. In partnership with Jewish Care and Tower Hamlets Council, The Rescuers will be followed by a talk and Q&A with Holocaust educator Mike Levy. In partnership with Manchester City Council and HOME cinema, The Rescuers will be followed by a presentation and Q&A with Kindertransport survivor Dr Peter Kurer, chaired by Holocaust educator Mike Levy.